“Roughing It” In the Bush. This post starts from the first step up the bank of the the Porcupine River to Joe’s cabin. We were relieved to see the flood waters had not topped as far as the cabin, although plenty of water had still gone over bank-full height and flooded the lower terrace of his property. I hauled the gear from the boat as Joe set about opening the cabin. Since there was no flood damage to be repaired, we started a leisurely existence at the cabin consisting of small projects (what Joe (and ironically my Dad) called “puttering”), eating, sleeping, and reading a book. Between sessions of tackling Alex Haley’s “Roots”, I went for birding walks around the cabin, and ventured into the local slough. As needed, we traveled a few miles upriver to a clear-water stream and filled five gallon pails full of water for filtering. This peregrine falcon is a yearly nester in the cliff across from Joe’s cabin and through the years, the young chicks have learned to hunt from the treetops around the cabin. This Chipping sparrow was a new bird for the cabin, and an unusual one for so far north. The chipping sparrow sang its heart out and chased all other birds away from its perch. Beautiful and close looks at this green-wing teal were a treat! American widgeon were very common along the river, their call of ‘”wee wee wee” was often heard just below the bank. This cross fox is an unsual color phase! It’s actually just a red fox, but an incredible treat to see! A shot of the cross fox checking me out. White-crowned sparrows were a common bird. Every morning, all day, and all night a particularly vocal one would sing outside of the cabin. A cliff nesting raven sits over it brood. Blue bells are a common and beautiful flower in the region. Here they are also pictured with Jacob’s Ladder. One of the greatest lessons I learned on the trip came from Joe when he said “Just because you live in the Bush, doesn’t mean you have to do without”. Certainly over the years, through sweat, countless trips up the river and through the air, he and his wife had transformed the cabin into a home away from home. When living there permanently, the four garden plots just out the door provided fresh vegetables. A solar panel amply charged a battery pack in the cabin allowing for electric lights and a water pump for a shower. In fact, it was possible to take a steaming hot shower each day if one desired! A large kitchen, bedroom, eclectic and huge library, and centralized wood-stove made living there extremely comfortable! This 360 degree panorama inside the cabin might be a big confusing, but take a while to look at it and appreciate how amazing it was! The cabin was crafted by Joe and took four years to build. One year to cut the logs, strip the bark, and let the logs season. Another season to put up the walls and cut the lumber for the roof, and a couple more to finish the cabin entirely. All of the log-milling was completed with a chainsaw. For his first and last cabin, Joe did a perfect job. The cabin is in pristine condition, and I marveled at it a lot! This outside shot of the cabin shows just some of it’s beauty and perfection! Aside from birding and reading, I enjoyed the views of the river. Life on the river changed constantly. After the first couple of days the water receded enough that a prominent gravel bar emerged for the first time since the flood. A flock of twelve long-tailed ducks repeatedly flew up river and drifted down. Each cloudless night the moon rose over the far banks, and the low light of a mid-night sun lit up the bluffs across the river in orange and gold. Life was good on the banks of the Porcupine. Low-light each night would light up the bluff across from the cabin in dramatic and beautiful light. Going to the bathroom was no drudgery at the cabin – this was the view from the outhouse door! Although not all experiences in the bush need to be plush and care-free like this trip, I certainly have a new viewpoint that such an existence is even possible. Just because you live in the bush doesn’t mean you have to do without! Delta enjoyed the leisure time as much as I did. It is amazing to think of the great-horned owl as a globally distributed bird. When we hear then hooting in our local woods, it is easy to forget their range extends far beyond the borders of our neighborhood or even the United States. In fact, a large piece of their range classified as “year-around” is found in southern Brazil and northern Argentina (http://www.allaboutbirds.org/guide/great_horned_owl/lifehistory). A geographically diverse bird! Throughout their range, it is remarkable to think of the different organisms they have adapted to eat in the mountains, taiga, plains, or even jungle! Although you might traditionally think of the great-horned owl feeding on rodents or small mammals, these top-tier predators may even prey on larger raptors such as ospreys. Great-horned owls are often hard to spot, and may perch in nearly unviewable thickets. Good opportunities to view them can be few-and-far-between, but I recently got a great chance to watch a great-horned owl. It was my first time ever observing one for a notable period of time. After nearly 45 minutes of observation, I found the hour in the life an owl to be rather uneventful, haha! However, even at that my time spent watching this majestic bird clean itself, hoot, shift its gaze to sounds in the woods, and twist its head back and forth were very unforgettable! That’s what I bring to you today :). Aside from the video I shot a bunch of photography. This gallery below pretty much sums up the behaviors of this owl when I was there. Cheers! When we first found this owl, it was sitting in a very, very large black spruce. Great-horned giving me the stink eye! The owl would call periodically, and when it did, a patch of feathers inflated under its chin. The Alaska Songbird Institute has a goal for people during their second annual “Bird-a-thon” : find as many birds as you can within 24 hours in Alaska. We, team MRI (Madi, Ross, and Ian), decided to take the task seriously! We started our 24 hour window at 8:00 PM by birding a range of Fairbanks hot-spots. 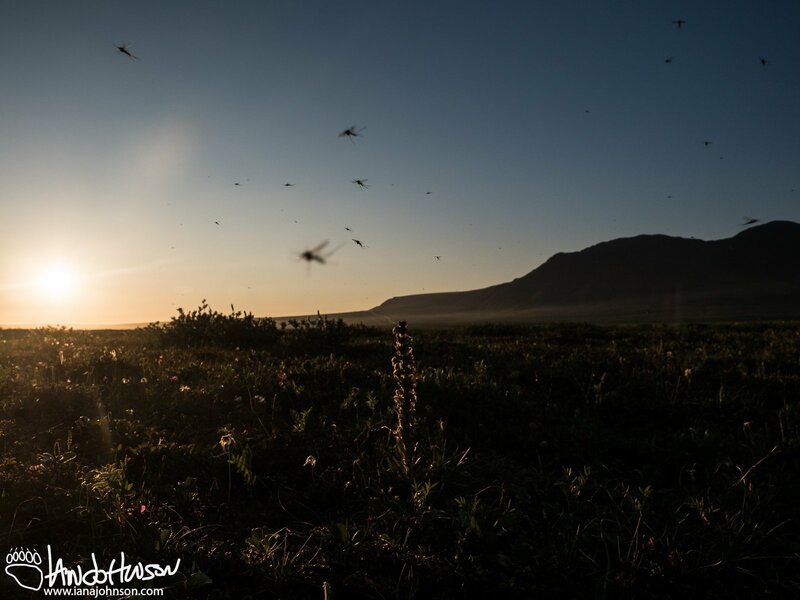 From there we headed south along the Richardson highway with the goal of making it Paxson to bird the Denali Highway – a 134 mile stretch of wetland potholes and alpine tundra chock-ful of birds. May 15th was the first day the Denali Highway was officially open, and much of the Denali Highway’s tundra was still covered in snow due to 3000′ elevation gain. Because of the low-productivity of snow-covered areas, we targeted melt areas and ponds. There were many, many species of birds. Some of them, such as red-throated loons were still passing through to breed on lakes further north over the Brooks Range, using the Denali Highway region as a “stopover” until the ponds further north were ice free. But, the site was not a stopover for most. Many of the birds were there to make a nest and raise young in the 24 hour light. The tundra is the summer home of many species which are found in vastly different habitats during the winter. For instance, the long-tailed jaeger is an ocean bird. During the summer they nest in the tundra and eat berries and small rodents. Quite a change from the fish they traditionally consume! Wilson’s warbler migrate to South America, and arctic terns migrate to Antarctica (the longest animal migration). In fact, the Alaskan tundra is so unique and special that birds from six of the seven continents can be found on it. For those that see the tundra frozen in the winter, it is easy to forget the tundra is a highly valuable and necessary ecosystem! Long-tailed Jaeger, check out that tail! Wilson’s Warbler – one of my favorites! Cliff Swallow coming in for a landing! A pair of Barrow’s Goldeneye. Such a beautiful duck! A male Barrow’s Goldeneye – such an eye! White-crowned Sparrow on the runway. Aside from the birds, the scenery of the Denali Highway is never ending! The melting ponds and flowing rivers created a patchwork of light and dark across the land. To the north, the horizon was ragged like torn cloth with the mountains of the Alaska Range. In the twilight at 2:00 AM (because it no longer gets fully dark here), the Alaskan Range stabbed through the colors of the sunset and on bluebird days like the one we had its snow covered peaks starkly contrasted the thawing tundra and blue sky. A sprawling mountain vista juxtaposed to the Denali Highway. A beautiful lake and mountain scene. This lake held black scoters, a common loon, and surf scoters along with many species of waterfowl. The sun sits high in the sky as we get closer to summer! Here’s a beautiful vista along the Denali Highway. Perched up high on a hillside, we watched moose, caribou, and long-tailed jaegers from this particular position on the Denali Highway. A piece of driftwood is set high and dry after the spring melt. A shallow melt water stream pours of round boulders and rocks. This panorama captures an active melt pond. The ice that was left concentrated many shorebirds and waterfowl in the open water. In the twlight of the sun at ~2:00 Am the Alaska Range was lit up over Donnelly Creek. Along with the birds, there was plenty of mammals to see. By the end of the trip we watched well over 20 moose and probably 30 caribou. Arctic ground squirrels fed along the roadsides, and frolicked across the snow. The young animals of spring are out and about, and we enjoyed watching a red fox kit chew on some grass outside of its den after we returned to Fairbanks. A herd of caribou navigate around a pond with the expanse of the tundra behind them. A mother moose and her yearly calf browse on new growth of willow. Two bull caribou lounge about in velvet antlers. This fox kit was a joy to watch. You can tell by the smooth walls of this den that they have spent quite a bit time going in and out. So, bringing it back to where it all started, why go birding for 24 hours straight? It seems that it might be a bit crazy (for instance getting about 3-4 hours of sleep). To understand that, you simply have to understand what I believe birding is. Birding is a chance to observe the natural environment either individually or with friends. An opportunity to go birding with a two great friends (we rock, MRI!) in a place as remote and diverse as Interior Alaska is a moment to relax and learn something new (essentially a guarantee); it should not be passed up. Even if observing wildlife is not for you, my definition of “birding” can be modified to fit almost any hobby. Don’t pass up opportunities to learn and be with good friends. After 24 hours, we identified 68 species of birds; a pretty remarkable list and I cannot wait until next year’s Bird-a-thon! Here’s the list of observed species during team MRI bird-a-thon. 68 species in 24 hours! Ironically we did not turn up a black-capped chickadee – very ironic considering they are a classic species of Alaska.